This notion that hyperinflation is how a nation collapses is very superficial. The real issue behind the collapse of a country is the collapse in the CONFIDENCE of the government. This is why we tend to see what people call “hyperinflation” in revolutionary and third world economies compared to the primary financial center economies. We have conducted extensive studies on this to investigate if there is some level of “inflation” that if crossed will cause hyperinflation. The answer in NO. These ideas have proven to be the same old problem of one-dimensional thinking that IF this THEN that. One-dimensional thinking is the classic way to program a computer and it is how you design an Expert System. Take medicine for example. You can create a list of all disease and its symptom. Then create the interface for the question as to what the symptom the person is experiencing. With this input, the computer program uses the classic IF THEN ELSE method to arrive at the answer. IF this THEN the answer is or ELSE keep search down the list until you find the match. When you enter the field of programming, you are confronted with how we actually THINK. 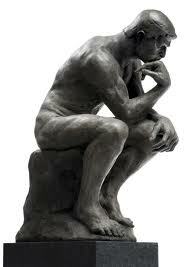 You quickly realize the difference between this one-dimensional thinking and dynamic thinking. 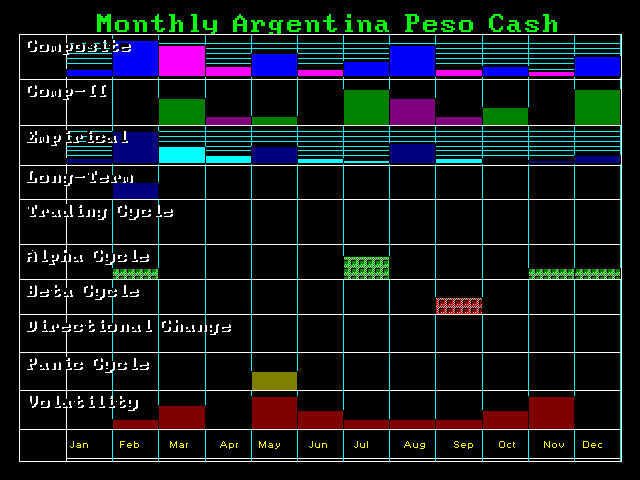 What is going on right now in Argentina is classic and it illustrates the problem with this notion of hyperinflation that assumes if you merely increase the money supply you will inflate. This one-for-one relationship does not exist in anything. 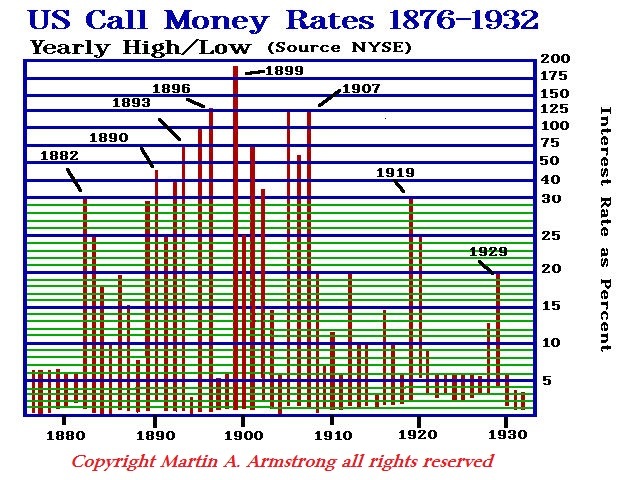 We took interest rates and attempted this same one-dimensional thinking that IF interest rates reached a certain level THEN the stock market would crash. We found that the stock market has NEVER peaked with the same level of interest rates twice. Hence, that theory is equally bogus. The brain actually thinks dynamically. You may have gone to dinner with a girlfriend you fell in love with. That event can be recalled through just a fragment of information on any of your senses. You can hear a song that was playing that you did not even pay attention to at the moment and your brain will match that sound to that event and you will amazingly have that memory retrieved from your mental archive. The same is true about the place, the food, or visually what she or you wore. The mind is fascinating for everything is connected dynamically – it is not a IF THEN ELSE flat model system. Yet strangely, our conscious mind works linearly in this IF THEN ELSE manner. This is why we find it so difficult to function dynamically intentionally. Our consciousness seems to be linear in its function as a default always trying to use this flat model, yet the way the brain actually functions is dynamic. What we are witnessing in Argentina is how the real world functions. This is the collapse in the confidence of government. The US dollar was traded in banks and markets 23.5 cents higher yesterday, its largest hike in 12 years, with a buying rate of 7.075 pesos and a selling rate of 7.125 pesos. The Argentine currency has experienced a similarly sharp rise during yesterday’s trading, climbing five cents during the course of the day despite the Central Bank selling off 200 million dollars of reserves. The parallel ‘blue’ dollar, meanwhile, hit a new record as it flew up 29 cents, and closed in unofficial markets at 12.5 pesos (selling). There is no magic formula that anything can be reduced to where we arrive at the simple one-dimensional logical conclusion. It is not IF THEN ELSE, but IF THIS, THAT, AND THE MULTITUDE OF THINGS OVER THERE BALANCE – THEN that or ELSE this. 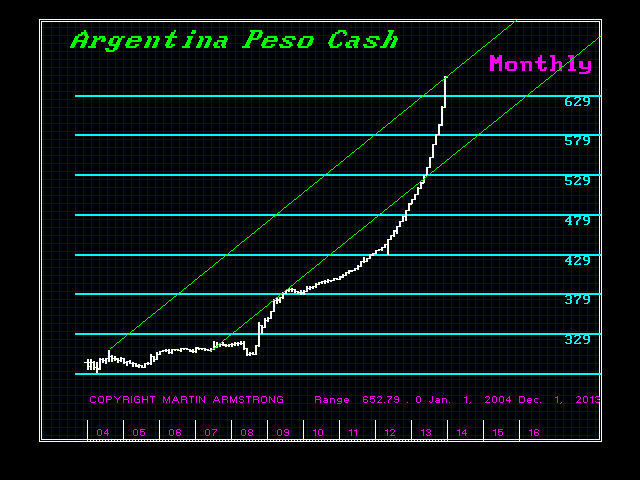 Argentina confiscated pension funds just as the USA is seriously thinking of doing to also sustain itself. However, this is part of the process of undermining CONFIDENCE. It has nothing to do with a quantified amount of money in circulation for society seems to panic based upon a host of factors all coming together. Searching for that magic formula to support a one-dimensional thought, go ahead; keep trying to apply the IF THEN model. You will only continue to lose your shirt, pants, home, wife, family, kids, and the dog. It is a far more dynamic interplay of variables than just that. Argentina is doomed. The government will collapse. It has crossed the line of Public Confidence. The more Draconian it becomes to sustain its power, the further the collapse in Public Confidence. Look at Ukraine. It had nothing to do with the quantity of money – it was a crisis in politics and corruption. It is always an admixture.